Luxembourg-based company, Kleos Space S.A., has successfully closed 6.96 Mio EUR (11 Mio AUD) in funding and began trading on the Australian Stock Exchange on Friday 24 August 2018 at 11 am Sydney time (3:00 am CET). Co-founder and CEO of the company, Andy Bowyer, feels that the interest shown in Kleos Space by investors is reflective of the world’s current desire to advance space-powered intelligence, particularly in Australia: “The capital raising had significant interest from Australian based institutional groups. Our listing comes at a time where governments around the world are seeking new technology to protect their borders, and we believe Kleos will provide a solution”. The company’s satellites will be able to locate radio transmissions from anywhere on Earth, detecting where the transmission was transmitted from, and when. “When ships turn off their transponders at sea, our satellites can capture the ships other transmission activity from space. This other data is critical for governments, and will give them the ability to track ships used by drug and people smugglers, terrorists, pirates, illegal fishermen and those in need of search and rescue”, Andy Bowyer said. Kleos Space has a Non-US (rest of world) first mover advantage to work with governments and commercial information users in the global 25.95 Mia EUR Intelligence Surveillance Reconnaissance (ISR) market. The company then aims to scale its customer base into wider non-maritime and non-defence markets such as environmental protection, search and rescue services and insurance services. 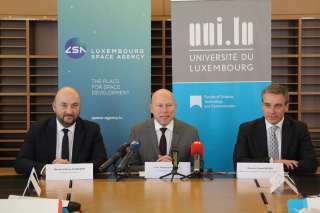 Supported by the Luxembourg government, Kleos Space already plans to construct the company’s first satellites: “We have recently signed a 2.2 million EUR agreement with Nasdaq-listed GomSpace who will deliver our first satellite system by mid-2019. We are also in early stage discussions with a number of high profile space race contenders who have the ability to launch our satellites into orbit”, says Andy Bowyer. After the successful first mission, Kleos Space hopes to grow its number of satellite systems and strengthen the company’s service offering. It is aiming for 20 satellite systems in low Earth orbit until it reaches continuous worldwide coverage. This improves the company’s service offering by providing surveillance across a number of markets, with near real-time information tailored to customers’ needs. 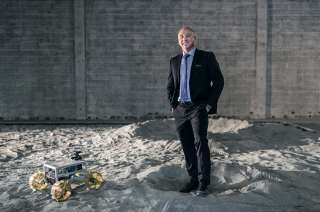 Peter Round, Chairman of Kleos Space and ex Capabilities Director at the European Defence Agency, hopes that the Australian Government will become one of their future customers in the company’s regional expansion plans. 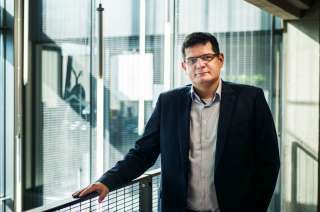 “With Australia’s large coastline borders under the constant threat of people smuggling and illegal fishing, our satellite technology offers an alternative to current land-based solutions, which are expensive, technically limited by range, and subject to counter threats”, Peter Round said. In May, the Australian federal government introduced a new legislation aimed at growing Australia’s satellite launch capability, and announced it will provide 16.5 million EUR (26 million AUD) to establish a national space agency. In 2017 the Government also pledged to invest 317 million EUR (500 million AUD) in improving Australia’s space-based Intelligence, Surveillance and Reconnaissance (ISR) capabilities. “It is clear that Australia is seeking new technologies to support its defence operations, border protection and humanitarian missions, and we plan to leverage our Canberra based office to align ourselves with these Australian Government initiatives”, says Peter Round.